This post was originally published by Eli Orzessek in nzherald.co.nz on 30 June 2016. “That’s the house they used on the first season of the US Bachelor,” he said, pointing out that any eligible bachelor could rent the place for a mere $14,000 a night – reduced from $45,000, so it’s actually a bit of a bargain. My bachelor flatmate and I stayed at a much more humble abode – a cabin at Paihia Beachside Holiday Park. Although it wasn’t exactly a mansion, the beautiful location with a private beach and stunning views of the bay was priceless in itself. The Bay of Islands seems to be an extremely popular destination for the Bachelor set – several of our arranged activities turned out to be replicas of dates seen on the series, and locals were keen to point all the sights featured on various seasons of the show. 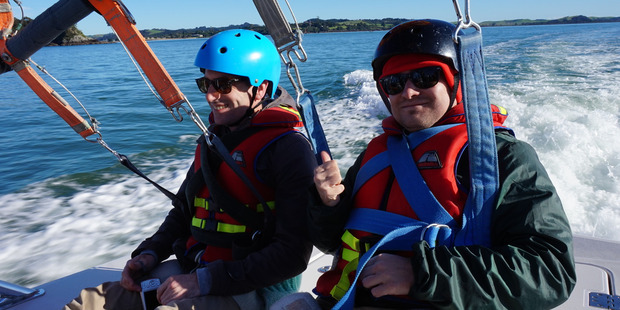 A group of about six Indian bachelors accompanied us out on a trip with Flying Kiwi Parasail, which promotes itself as getting clients higher in the air than other New Zealand operators. Originally, I was supposed to be jumping out of a plane, which I felt a little dubious about. However, going from down to up seemed a bit less daunting than up to down – and by the time I was launched into the sky with a friend by my side, 365m didn’t seem all that intimidating after all. And what a view! There’s really no better way to observe the spectacular landscapes, plus it’s very peaceful floating in the sky and looking down on everything. But I wouldn’t recommend what the other guys decided to do. In summer, the usual practice is to be dunked in the water at the end of the ride – but this was mid-June and the water was freezing. However, once the first of us was dunked, everyone had to try. One guy was shivering so hard afterwards he nearly tipped the boat over – but you only live once, right? Although it’s generally known as a summer holiday destination, Paihia and the surrounding islands have a lot to offer in the cooler months. 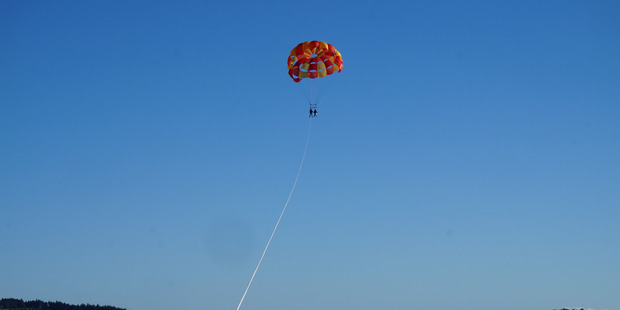 The only way, if temporarily, is up with Flying Kiwi Parasail. We were accompanied to the native bird sanctuary on Moturua Island by William Fuller, the principal of Russell Primary School, as a preview of the upcoming Bay of Islands walking weekend. The crisp but sunny weather was perfect for a spot of bushwalking. It’s a tranquil spot with a lot of history – the Queen even visited once and was said to have surprised an unknowing local who asked if she had heard about the royal visit. Ever the joker, the regal tourist played along. We followed a looping track around the island, stopping occasionally for William to play birdsong on his phone to lure out feathered friends. It worked for the North Island robin and the whitehead but rare saddlebacks weren’t having any of it. Looking out from a spot that had been a Maori pa site and an army lookout, you could really sense the history of the area. I imagined ships arriving, cultures clashing and everything that happened after those fateful first meetings. As we waited for our water taxi to pick us up, we were treated to the sight of a school of dolphins leaping their way along the edge of the sheltered bay. Then it was time to recreate the Bachelor’s infamous group kayaking date – again, with no bachelorettes. We were joined by Shortland St’s Pua Magasiva and his friend for an expedition with Kayak Cruises. Our end goal was the Haruru Falls, a rare horseshoe-shaped waterfall at the end of the Waitangi River. For anyone thinking of taking on this activity in winter, I’d recommend a wetsuit. I love a good waterfall, so decided to take on the challenge of kayaking under it – even if it meant getting a little wet. However, my lack of experience with white-water kayaking meant I got more than a little wet when I bailed out of my kayak before making it under the falls. Afterwards, it seemed appropriate to continue on in Jordan Mauger’s footsteps to the treaty grounds. The recently opened Waitangi Museum is a must-visit for all New Zealanders and contains a wealth of information about the history of the area. For someone who had learned about it in school in a rather dry manner, it was an eye-opening experience. It’s worth taking the guided tour around these parts – even if you think you know it all, you’re bound to learn something new. The treaty grounds felt unsurprisingly familiar and the United Tribes flag flying from the flagpole was a welcome sight after all the fanfare of the flag referendum. One of those classic yellow plastic Kiwi cricket sets was set up in the exact spot the Bachelor hosted a cocktail party with the final five ladies and we couldn’t resist having a bit of a game before the cultural performance began at the marae. “Now you can tell everyone you’ve played cricket at Waitangi,” said a smiling local. Charlotte’s Kitchen is a restaurant with a great location – right on the Paihia Wharf, with a roof that opens in the summer. Every local we met waxed lyrical about the restaurant’s signature dish of slow-cooked pork knuckles. Unfortunately, we arrived at the restaurant just as the knuckles sold out. As a waitress brought some out to the table next to us and cracked them open, I was practically drooling as the aroma of crackling filled the air. Although the oysters and steak I had for dinner were great, I’m definitely going to have to come back to try the pork. Paihia is about a three-hour drive from Auckland. Find out more about getting to and around the Bay of Islands. Flying Kiwi Parasail operates from the Paihia Wharf. For more info, see their listing. Kayak Cruise operates from the Waitangi Wharf, for more info see their listing. The Bay of Islands Walking Weekend takes place from October 7 to 9. For more info, visit their website.